Superbird RM23U0A175587 now has a fake fender tag? 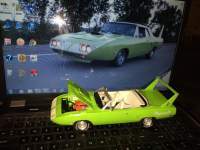 DodgeCharger.com Forum > Discussion Boards > Aero Cars (Moderators: Chryco Psycho, hemigeno, firefighter3931, Charger-Bodie) > Superbird RM23U0A175587 now has a fake fender tag? The other fender tag I saw for this car showed white body paint & D32 for an automatic. Re: Superbird RM23U0A175587 now has a fake fender tag? All that matters is the vin tag. If that were the case, the VIN tag by itself would be offered at the same price, no car included. Heck, you could collect them & trade them like baseball cards. Interesting that the seller covers himself by making no representation as to the how the car was originally equipped, other than the engine. With the fake tag, he offers fake representation by alleging it 'came this way'. Whoever had the tag made caused this car to take a severe hit in value. No one wants to buy a fake & now the car itself with have a scar on its history. Sad the hobby has transformed into 'building' original cars instead of restoring them the way they were built. 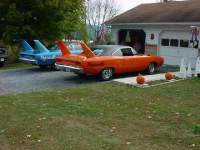 As far as I'm concerned, if an owner takes a known Superbird and transforms it into whatever engine, trans, color combo he/she wants, that's their prerogative. I don't agree with re-popping fender tags to try and suggest that's the way the car was originally equipped. Only ONE reason to do that...$$$$$! As a point of interest, here is the car in 1977 when it was in Wisconsin. Registry entry #2. Same state, but over 20 years later. Car has a few hundred more miles. Clearly called out as EW1 with D32. Clearly a reproduction tag from the current auction listing. Why didn't he just fake it into a Hemi car why he was at it. FM3 Panther pink to. LEON. It’s a chameleon. Went white-blue-white-green. Well, a reproduction tag would be an exact copy of the original. This one contains lies stamped in metal, so it is a fake. And how many new owners later will it take to be sworn as the real deal ?? Over here (UK)….selling that without making it perfectly clear that the detail on the tag do NOT apply to that car from new would be a criminal and imprisonable offence....fraud. But up until you sell it you can do as you will!! Its like winding the speedo odometer back to show less miles....it only becomes an offence when you try to sell it without disclosing that fact. We don't like to use the F word here in America..
Fakers & Frauds do exist, that is a Fact. Faking fender tags & any other documentation lowers the monetary value of any car. One fake item can bring the rest of the numbers into question - If one item was faked, was anything else faked? It is a great way to make potential buyers run away, wallet intact.